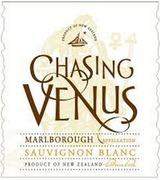 Chasing Venus wines are produced from grapes grown on small family farms in the acclaimed Marlborough appellation. Griggs Vineyard is situated in an old riverbed against the eastern hills of the appellation. The gravelly, well-drained soils promote pronounced grapefruit flavors. The Burdon-Shutkowski vineyard is located near Grove Town, at the very southern edge of the Marlborough appellation, and produces fruit with a wonderful balance of herbal and citrus and stony mineral notes.